Solar flares regularly burst out of the sun shooting out in all directions. The earth is a small target, so we don’t get hit that often. Usually, when the earth does take a hit, most of us don’t even notice. Solar flares are a real danger to astronauts. But, here on earth, not only does our atmosphere protect us, but we’re finding out that it’s been proactive in its protection of the earth from these solar lightning bolts. In 1859, the earth was struck by a really big solar flare of a particularly powerful type: a CME – coronal mass ejection. We know from the study of ancient ice cores, that a CME that big only hits the earth about once every 500 years. Still, if this particular CME had hit the earth a hundred years earlier, most people would have hardly noticed. But there’s always one effect that’s hard to miss. When a CME hits the earth, it creates a big, bright, and spectacular event – the aurora borealis — better known in the northern hemisphere as the Northern Lights. When that 1859 solar flare hit the earth, there was an amazing light show. Usually the northern lights are not visible too far south of the arctic and are rarely seen in the 48 United States. But on September 1, 1859, the Lights could be seen in all the 48 states, Mexico, Central America and, even, on the northern coast of South America. People in New York could read newspapers in the middle of the night because the Northern Lights were so bright. If the Carrington Event had happened a hundred years earlier, that’s all anyone would have noticed. But in 1859, we had telegraphs. And telegraphs used electricity. And electrical power was the problem. A CME this strong supercharges the earth’s atmosphere with electrical energy. When you charge anything with that much energy, it becomes “conductive” – in other words, electricity leaves wires and passes right through the air and into the ground. Some telegraph operators found their equipment lost power. Stranger still, when that much electricity flows through the air, it can jump into electrical systems, even if they aren’t plugged in. So one telegraph operator disconnected his equipment from its power source only to have it throw sparks and shock him. Another operator disconnected his equipment and found that it didn’t make any difference. Even turned off, the telegraph continued to receive messages. And he found that he could respond by telegraphing outgoing messages without any power source at all. We’ve never had a solar flare that strong since. But, even if later flares weren’t that strong, they caused more trouble. Why? Because we were, and are, using more and more electrical equipment. 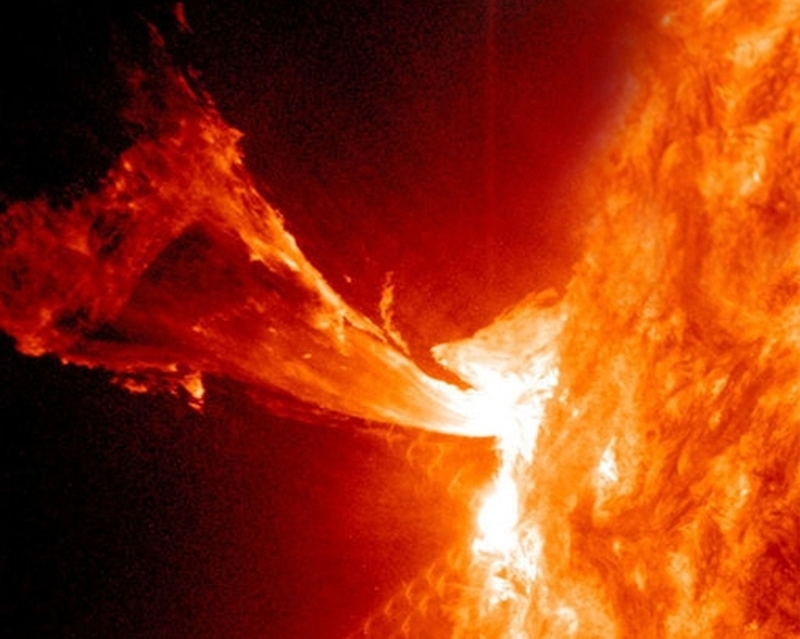 Solar flares, of the CME variety, don’t get along with electrical equipment at all. In November of 1882, a telegraph office caught fire. In May of 1921, all telegraph traffic was brought to a complete stop. Power grids throughout the Northeast failed with resulting blackouts. In 1989, a CME caused a massive black out in Canada. Solution? There actually is a simple solution to most of the problems caused by CME’s — turn everything off before the flare gets here. Since solar flares are easy to detect, and the sun is a long way off, we generally know “when one is coming.” And when it does, we can power down almost everything. Almost everything? Yes. You can power down almost, but not quite, everything. Hospitals, emergency services, and aircraft in flight can’t power-down all of their equipment. Some believe we should install really expensive shielding equipment to protect everything. Honestly, it would be too expensive to protect everything. Powering down is actually a good and economical solution. But that expensive shielding equipment is a really good idea for equipment used in emergency services, critical communications, and air travel to name just three examples. We’ve always thought that, when a solar flare strikes, the earth just sits in space and “takes it.” But, now, we find out that the earth has been protecting us all along. We really would have got something a lot worse if the earth hadn’t been raising its umbrella with each approaching storm. The earth withstands a vast and constant flow of energetic particles from the sun — the solar wind. But earth isn’t just a rock floating in space — protected only by a thin layer of gas – our atmosphere. Energy constantly flows out and away from the sun. But the earth has its own energy envelope — as anyone knows who’s ever used a compass. The consistent pointing of the compass needle to the north demonstrates the constant flow of a sea of energetic particles around our planet. You might say that the earth has its own “aura” – a fairly constant electromagnetic envelope that withstands the energetic force of the relentless solar wind. And holding its own against the solar wind isn’t always easy. If you could see the earth’s energy envelope, you’d be surprised to find that the earth has an ever-present “tail” – sort of like a comet. The tail always extends from the earth and out in space in the direction opposite the sun. Why? Because the solar wind is blowing the earth’s energy envelop behind our planet like a loose garment flapping behind a person walking in a strong wind. To realize what the earth is doing, you have to remember that the earth has a bunch of “spheres.” The atmosphere is composed of layers of gas. But there are other “spheres” like the ionosphere and magnetosphere. These “spheres” are purely energetic – composed entirely of charged particles – and have nothing to do with gas. The magnetosphere is a flow of charged particles that forms a layer of energy around the earth. That layer, in turn, forms a boundary between the earth’s own magnetic envelope and the ever-rushing solar wind. Researchers have long known that it was just these layers — fields of charged particles — that minimize the harmful effects of major solar outbursts like solar flares. Solar flares can, and do, cause a lot of electrical problems on earth, but were it not for our own energy envelope, all life on earth would be on the receiving end of deadly blasts of solar radiation. But what came as a surprise was the discovery that the earth engages in what seems like an active defense — raising a special umbrella in response to the impact of particularly powerful solar flares. The earth is surrounded by a magnetic envelope, the magnetosphere — sort of like a donut. But this donut is so fat with covers pretty much the entire planet. The donut is formed by the swirl of the earth’s own charged particles flowing out into space until they lose momentum and fall together to form the outside wall of that giant donut. As more changed particles flow out from the earth, they are caught by this layer and thrown back – swirling toward the earth’s surface. But the magnetosphere isn’t alone. A bit closer to the earth, and just “under” the magnetosphere, is another “sphere.” The plasmasphere is formed when the ultraviolent light from the sun charges the earth’s upper atmosphere. Plasma is actually something between a gas and a liquid. And that “something” is always highly charged with energy. The earth’s plasma forms another donut just inside the magnetosphere. But not always. Sometimes, the earth fights back. In January of 2013, Brian Walsh and his colleagues at NASA’s Goddard Space Flight Center in Greenbelt, Maryland witnessed something amazing. Ground sensors mapped a “tendril” of highly charged particles moving from the North Pole out toward the sun. What did it mean? Well, it meant that a plume of plasma was leaving the earth and heading toward the sun. But why? Most charged particles are blown back, in the direction opposite the sun, by the powerful solar wind. Why was a plume of highly charged plasma moving in toward the sun? The explanation was even more amazing. A strong blast of solar energy had hit the earth so hard that it tore a hole in the magnetosphere. Passing through the earth’s outer energy barrier of protection, the energy from the solar flare, then, hit the plasmasphere — which reacted by . . . hitting back! Although torn by the first contact, the plasmasphere not only resisted the blast of solar energy, but formed a plume of plasma. The plume flowed toward the opening, the area of damage, in the magnetosphere to “plug the hole.” The plasma “plug” can slow or stop the seeping flow of the flare’s charged particles toward the earth. This entry was posted in Grossmann: The Earth’s Umbrella – A Shield against Solar Storms and tagged Grossmann: The Earth’s Umbrella – A Shield against Solar Storms. Bookmark the permalink.